It’s about time adults got their own brownie, don’t you think? One of me and my husband’s favorite pastimes is exploring Chicago’s thriving beer scene and discovering our local favorites — Half Acre being one of them. We might be a tad biased as my husband races for their cycling team, but their beer really does speak for itself. One of my favorites is the Big Hugs imperial stout, a specialty brew (aka: only available as a special release) that’s big (10% ABV) and chocolatey. 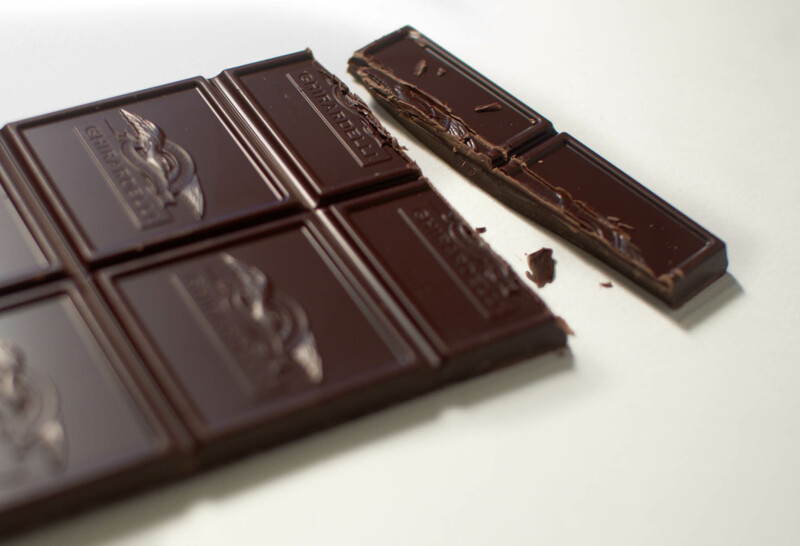 Chocolatey, you say? 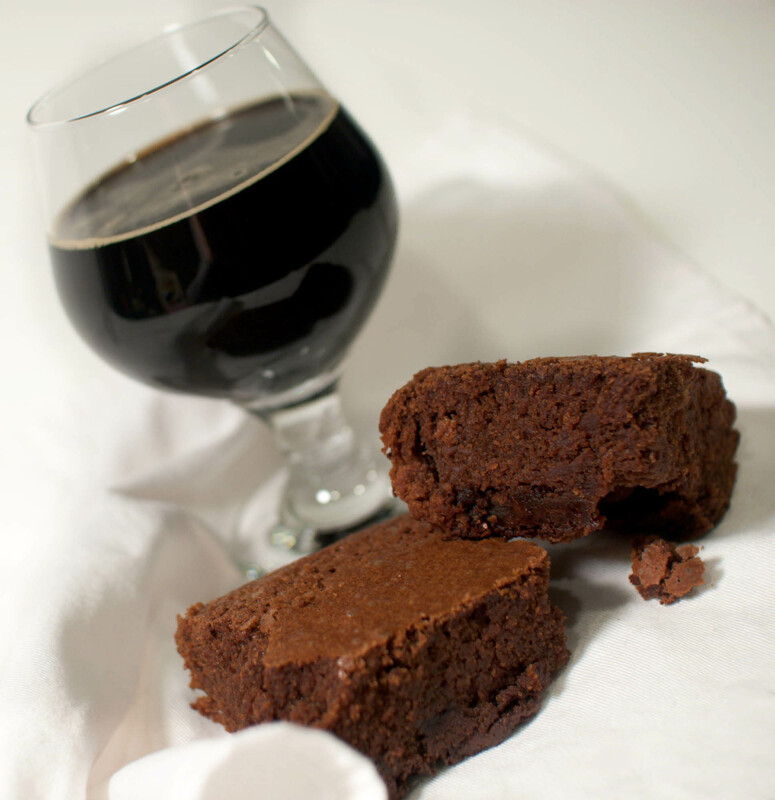 This very idea inspired me to combine my favorite chocolatey beer with my favorite chocolate dessert — the brownie. 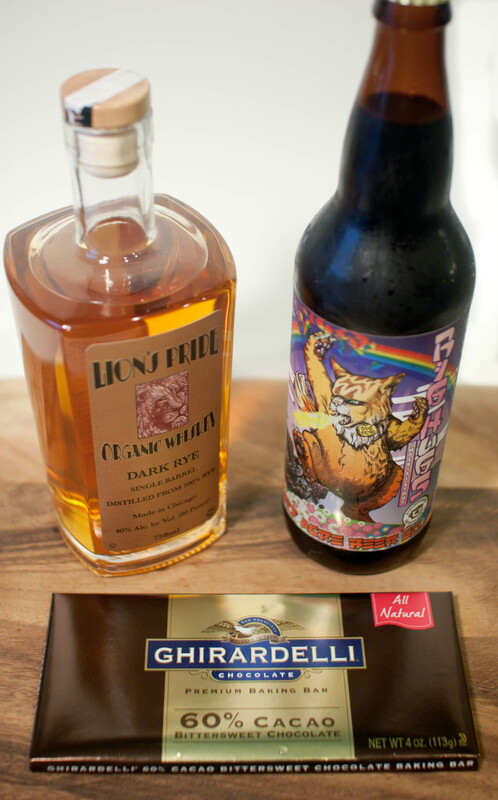 And why not throw a little Lion’s Pride whiskey from Koval — a local distillery — in there, too? You know, for good measure. How bad could it be? As it turns out, not bad. Not bad at all. In fact, my husband declared this recipe his all-time favorite, and I’d have to agree — I think they’re my new favorite, too. Perfectly fudgy and outrageously chocolatley with a hint of edge from the booze, they’re a match made in chocolate heaven. Preheat oven to 325 degrees. Prepare a 9-inch square baking pan by buttering (I used the butter left behind on the wrapper from the stick required in the recipe) and dusting the inside with cocoa powder. Set aside. In a large saucepan, melt butter over low heat until completely melted. Add chopped chocolate, stirring often, until melted and smooth. Remove saucepan from heat and let cool to luke-warm. Stir the sugars into the chocolate and mix well. In a large mixing bowl, beat together eggs, yolks, vanilla, stout and whiskey until smooth. Sift flour and salt in to the mixture and stir to combine. Add cooled chocolate mixture to the egg/stout/flour mixture a little at a time, folding to combine, until all the chocolate has been added. Fold in chocolate chips, being careful not to over-mix. Pour batter into the prepared pan and bake for about an hour. Let cool before cutting. Oh yah, baby! LOL! I was just watching Chuck’s Day Off the other night and saw he made a Stout Bread Pudding…adding in some nice, heady, chocolate-y beer into the mix, and I thought, Whoa, what an awesome idea!! I add it into my chili and stews, why not sweet decadent stuff, too?! Yours looks AMAZING. I would definitely drink a dark beer while eating these brownies. Yum. How fun! LOL…I’m a little excited about this, can’t you tell?! Haha. I was excited about them, too! I hope you make them — they’re so good! We really enjoyed reading about this recipe so we shared it with our readers at MidwestBeer.com. Timely since our beer style of the month is stout! Thanks for the article and keep up the great work! Go figure! This sound delicious and unexpected! How fun. I too have loved the Chicago food scene. My angle has been visiting restaurants that work with farms or utilize local, seasonal produce. Found some fabulous restaurants and all so different from each other! Great food town. I’m sure the beer makes them extra gooey. This post has seriously got me craving some brownies. 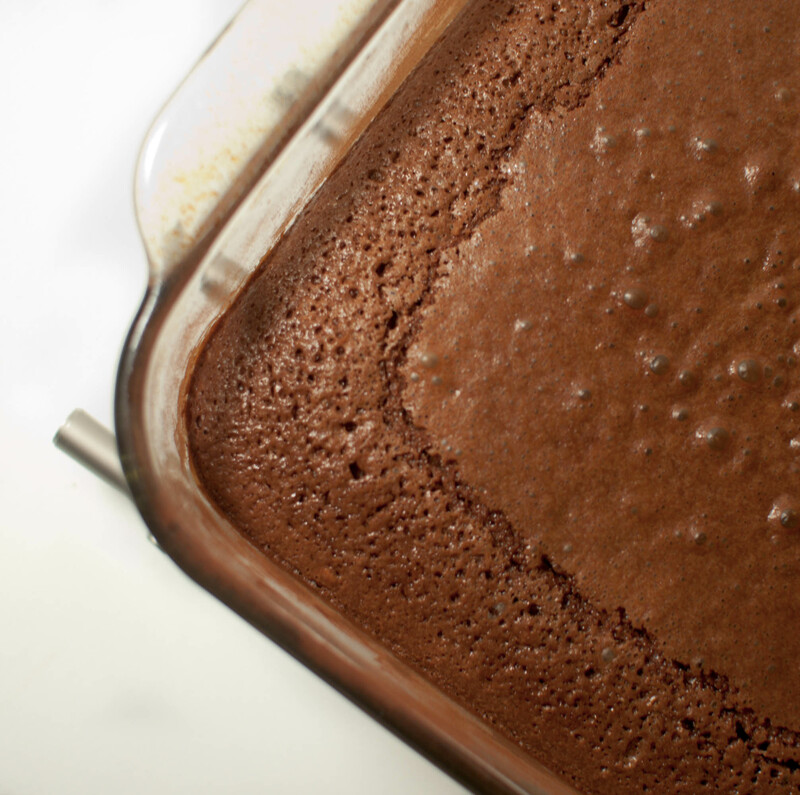 I have a chocolate stout cake recipe that’s divine, so I KNOW just how good these have to be. Seriously… beer AND whisky? There are no words! Amazing! I’ve made stout cupcakes before. I thought the batter tasted a little weird, but they are soooo good! Although I like brownies better, so this is awesome! I was like… wait a minute, did she put the beer and whiskey in the brownies? Nah, she probably drank it WHILE making brownies. Surprise, surprise! Nice touch, Bobbi! Still not noon yet and you’re making me think about beer… This isn’t good! What is good, is this recipe. Thank you for this fantastic recipe! When I made it (today) Big Hugs was not readily available. I used Pipeworks’ Coffee Break Abduction in lieu of Half Acre. It smells amazing already!!! Awesome! Great choice — love Pipeworks, too. Enjoy.